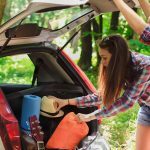 Camping doesn’t have to mean sleeping bags, tents and roll mats. 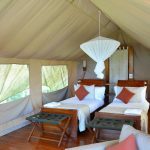 Australia is full of top end bush camps and wildlife sanctuaries, giving you the luxury camping experience. Many of these remote locations only have enough accommodation options for a few tourists at a time so you can experience them without the “tourists”. 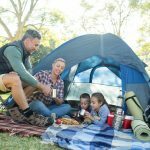 Luxury camping options in the Margaret River wine region have a positively colonial feel. The food and wine is on par with any five-star hotel has to offer and you are within spitting distance of the ocean. Of course, the vineyard tours on offer in the area draw the visitors, but the Grove Distillery also produces gin and beer, for non-wine drinkers. Nearby Lake Cave is well worth a visit with its still underground lake which perfectly reflects the awesome stalactites creating a magical eerie wonderland feel. The Kimberley has several luxury options, including homesteads with luxury camping facilities. Cliffside retreats and coastal camps litter the region, offering spectacular views over the gorges and ocean. Luxury camping in the Kimberley region offers a stark contrast to the feeding crocodiles, wild landscapes, segments of primitive rock art, nocturnal wandering dingoes and breakfasting wallabies. There are whale watching excursions, national parks to explore and plenty of migrating birds to gaze at, giving you plenty of things to do to fill your days. Billed as “where the outback meets the reef”, Ningaloo offers the best of both worlds. 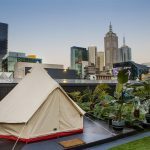 There are seasonal luxury camping options in the area, immersed in the wilderness giving you an authentic outback experience. You don’t have to experience backcountry Australia in discomfort. The luxury camp sites cater for your every need, with cotton beds and no frills eco-luxury to preserve the beautiful natural surroundings. In the Mary River wetlands, you feel as far away from civilisation as it is possible to get. Yet there are bungalow camps with first-rate amenities and comfort. There are plenty of wildlife safaris to take, including crocodile spotting trips. There are some luxury accommodation options around “the rock” which provide unparalleled views of the national icon. The spiritual location begs to be camped in, helping you feel closer to the Anangu ancestors. The camping facilities offer canopied suites, putting you in contact with nature without the uncomfortable sleeping situation. You get to eat under the stars, under the watchful eye of Uluru for a once-in-a-lifetime experience. South Australia’s Flinders Ranges are a national treasure. 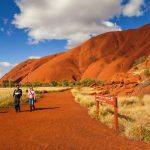 The region’s walking and hiking trails take in Australia’s impressive history, gorges and landscapes and is one of Australia’s few conservation successes, providing access to much of Australia’s flora and fauna. You can go on a night hike or a safari drive of the region to fully take in the magnitude of the landscape. For a luxury island escape, Kangaroo Island has a selection of lodges and camping retreats for an enchanting rest. The Southern Ocean views, fine dining experiences and wine selection make the region the perfect place for a romantic getaway at expense. What do you think? 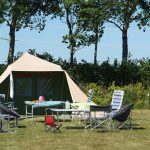 Do you have a favourite luxury camping spot? Share your thoughts and advice through the comments section below. AM I CAMPING WITH STYLE OR REALLY GLAMPING?